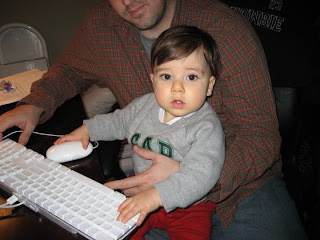 my son is a natural at computers. we did not position his little hands for this photo. somehow, he just knows what to do. he takes after his father - the IT networking guy - who can work with computers all day long at the office and then come home and sit in front of one all night long. all i have to say about that is, "stop the insanity!" Brent would be proud of the Mac!!! Very impressive Harrison! He'll be like my kids... teaching mommy how to work the computer. It's embarrassing.